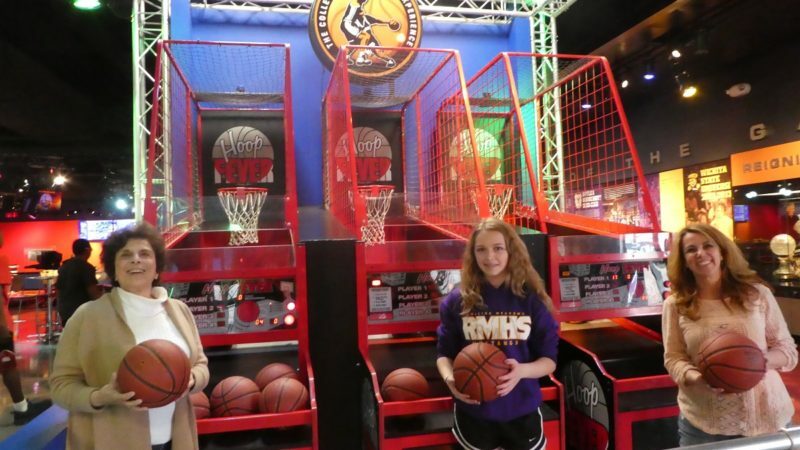 Photo by Jamie Bartosch/Suburban TravelingMom All ages can shoot hoops at College Basketball Experience in Kansas City. Kansas City, Missouri is everything you want in a multi-generation vacation destination. It’s easy to get to. There are a wide range of fun things to do. It’s easy to get around and navigate. And, perhaps most importantly, it’s budget-friendly. 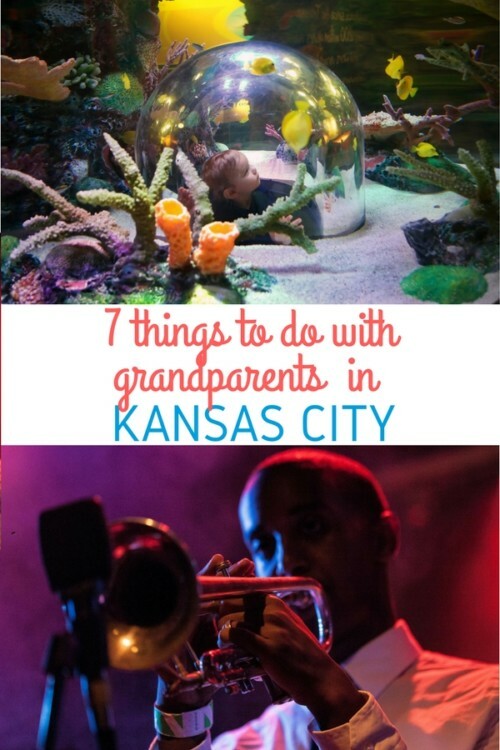 One grandma, two moms, and four kids, ages 7-13, recently spent a long weekend in Kansas City, Missouri, and every generation in our multi-generation group gave the city a big thumbs up. It’s a perfect blend of hipster and historic, and exudes both big and small town charm. But the main reason Kansas City is a great multi-generation vacation destination is that the generations can do everything together here, making it a more memorable trip for everyone. All ages loved Kansas City’s famous barbecue. And the live jazz music. And the toy museum. 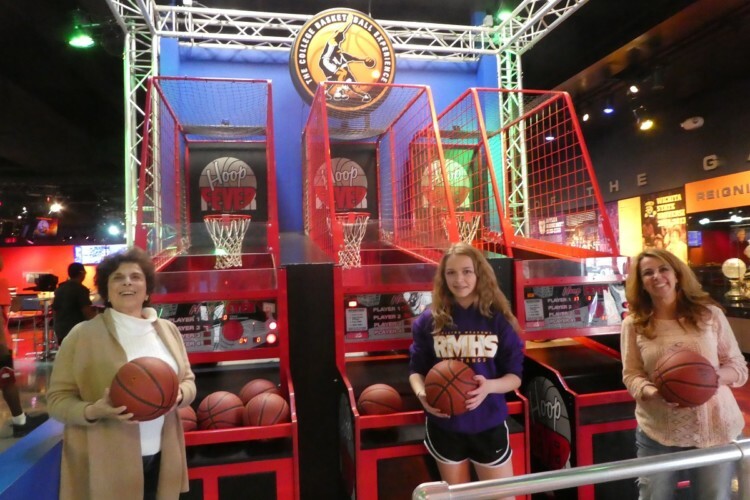 Grandma even played pop-a-shot against the grandkids at College Basketball Experience. There are some really practical things to love about Kansas City, too. It’s not too expensive. It’s easy to get around (including a free street car that goes up and down the main drag). The airport is delightfully small and fast. And there’s also a lot to do. Sorry, I can’t avoid using this description – CBE was a slam dunk with everyone. My basketball-loving kids could have stayed here all day. While it’s also the College Basketball Hall of Fame, that part of this place was empty during our visit. People come here to shoot hoops and play the cool basketball games set up around the two-story building. Younger kids will love the lower level, where there are lower nets for pickup games, rows of pop-a-shot games, and a fun target-hitting game for passes. Older kids will appreciate the upstairs area, especially the buzzer beater game. You get five seconds on the clock. Then you have to dribble to a lighted spot on the floor (which changes each time) and throw up the game-winning shot as a recording of cheering crowd plays. We liked the ESPN Broadcast Zone area so much, we did it multiple times. The adults, kids, and grandma paired up at the two-seat anchor desk and read off the teleprompter, doing our best Marv Albert voice impersonation (“YES!”), while announcing the final seconds of a famous college basketball game. You get to watch the tape playback to see your work. Bonus: there are basketball video games nearby to play while you’re waiting. After CBE, grab lunch at the nearby BRGR Kitchen & Bar – a place not only with great burgers (or, is it brgrs?) but fresh salads and friendly service. The restaurant is right along the free streetcar route. There are many, many places to find delicious barbecue in Kansas City. Jack Stack, a popular chain, will not disappoint. 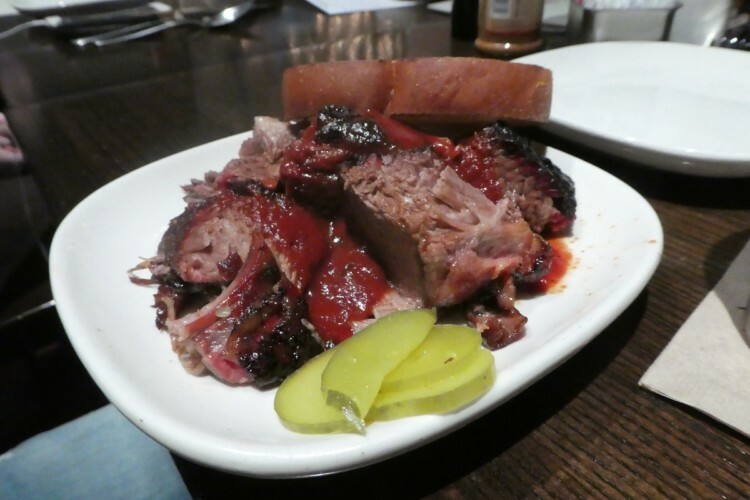 We started with an appetizer of burnt ends, the best thing you can order at a barbecue restaurant in my opinion. They’re both crunchy and tender, and just flat-out delicious. Then I dove into barbecued brisket piled into a massive baked potato. It was phenomenal. The kids nibbled on meaty ribs, from the kids’ menu, with just the right amount of sauce. 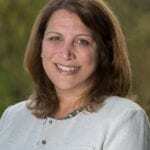 (Other TravelingMoms will back me up on this place, as you’ll see in this blog). 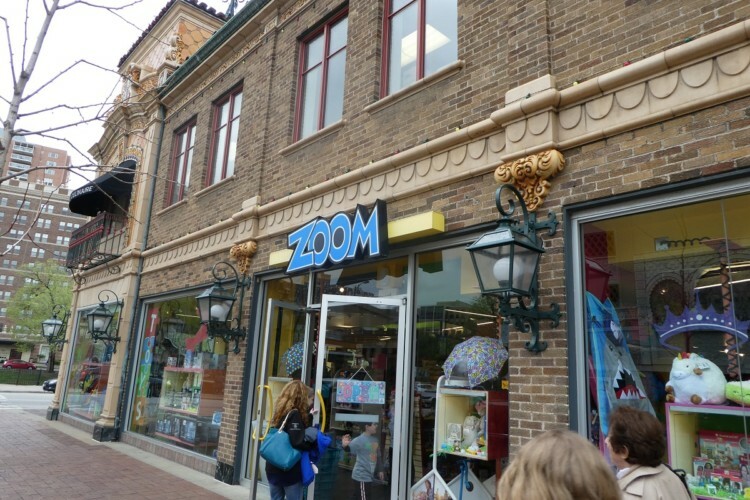 If you go to the Jack Stack in Country Club Plaza area, an upscale shopping and restaurant area with gorgeous Spanish architecture, you can walk to a super-fun toy store a few blocks away called Zoom. The ceiling’s lined with the owner’s collection of 240 awesome, fun-to-look-at retro lunch boxes (from shows like Welcome Back Kotter and Fat Albert). We had a blast shopping in Zoom, buying a fidget spinner (before it was a thing!) and toys you don’t find in typical stores, like “Tongue tattoos,” and the most adorable little picnic baskets with china tea sets in them. Naturally, grandma bought everyone a toy. “Oh, I used to have that toy!” was a familiar refrain from everyone in our group, especially grandma, as we went through this fun museum. 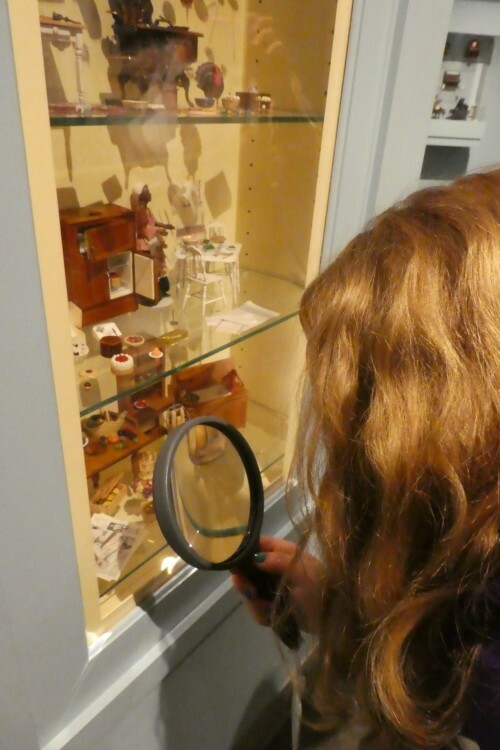 Toys from decades past are housed in glass cases, and while there were only a few hands-on activities, we all had fun looking at everything and reminiscing. I was thrilled to see a game I used to play in the 1970s, “Mystery Date Game.” There’s a whole area dedicated to Wizard of Oz costumes and toys, including Dorothy dolls from different parts of the world. Speaking of dolls, the museum’s doll collection is fantastic, even if a few look a bit spooky (which we kinda liked). The friendly museum staff told us the interesting backstories of some of the dolls, which made them a little less spooky. The miniatures were the coolest part of the museum, and had some hands-on stuff for the kids, like looking at the miniatures under a microscope. I’d recommend this museum for grades 3 and up. Not only is the jazz music an important part of Kansas City’s history, it’s an important part of the present. You don’t have to bring kids into a bar to see live jazz, although you can at The Blue Room, part of the American Jazz Museum. A better option is the 4:30 p.m. Friday afternoon concert at The Phoenix, where children a permitted until 8:30 p.m. (and food is served). The former speakeasy is a Kansas City landmark and hosts excellent live shows. 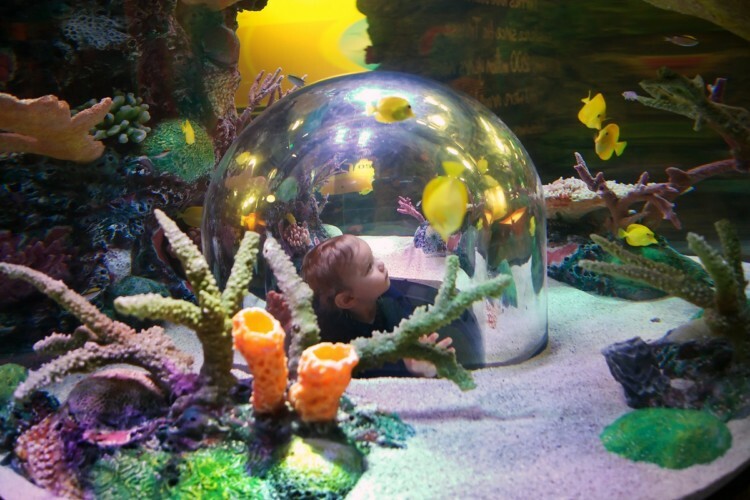 In the same area as SEA LIFE aquarium and Legoland discover this colorful and adorably decorated kids art studio. It’s geared toward little kids (I’d say, grades 3 and under), with lots of coloring and painting areas. My 13- and 11-year olds were a little bored here. But they still had fun – they sat with grandma and designed their own jigsaw puzzles and Mr. Magoo-like paper glasses, which we got to take home. Also, everyone liked goofing off in the actual kaleidoscope that projects wall-sized images with your faces included. SEA LIFE Aquarium and Legoland are next to each other. While I’m kinda over Legoland (but the kids like it – especially the 4D movie), you can buy one pass for both places. 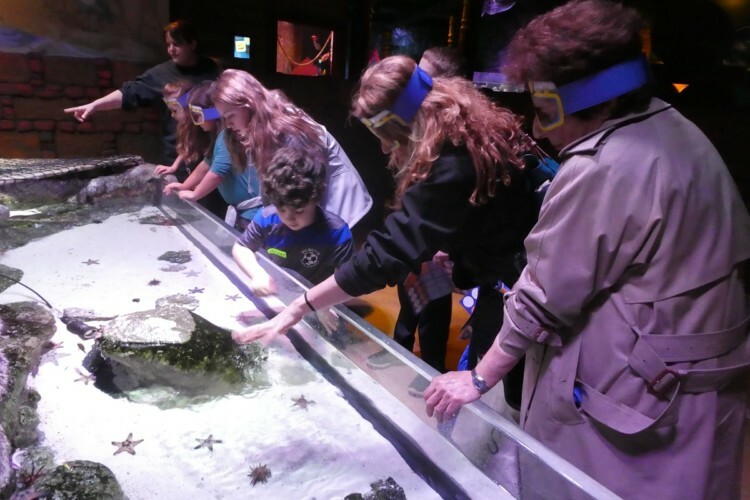 Or just go to the SEA LIFE Aquarium, which was terrific, with all sorts of hands-on activities like a touch tank that multi-generations could do together. Afterward, lunch at nearby Fritz’s Railroad Restaurant. The 50s-styled diner has an electric train that runs across the top and delivers your meal to a lift that lowers to your table. Also? You order your lunch by picking up the telephone in your booth. The menu is mostly greasy burgers and fries, but it’s a really fun family restaurant and the kids couldn’t have been happier. The front of the Nelson-Atkins Art Museum is a wide-open grassy area where kids can run around, which is always a good thing. There’s also a glass labyrinth that’s multi-gen friendly. Tip: don’t run, and walk with your hands in front of you so you don’t accidentally conk into the thick glass walls. The buttons you push to cross the street will say “Wait” if the light’s not green. My kids pushed them a few times and danced along to it like it was a hip-hop song. I have a feeling they’re going to forever associate this with Kansas City. 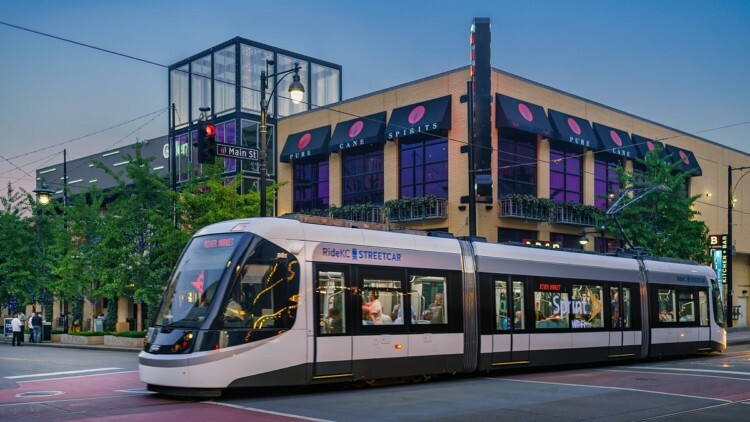 There’s a free streetcar that will take you to many tourist attractions, from Union Station (a gorgeous building) to the Riverfront area, where there is shopping and the Arabia Steamboat Museum. Also, in Country Club Plaza, cars will stop for you when you cross the street. Given that I live in Chicago, where drivers will mow down an old lady with a cane if it meant saving 2 seconds, this was novel and awesome. Kauffman Stadium, where the Kansas City Royals play, looks beautiful. We’re gonna go to a game and see these former World Champions next time we come back. Teaching TravelingMom Kirsten Maxwell also had some great suggestions of places to go in Kansas City, which you can read here. For more information on Kansas City, go to VisitKC.com.